*Grammy-nominated singer and Broadway star Fantasia Barrino, most often known simply as Fantasia, rose to fame as the 2004 “American Idol” winner. Later that year, she released her debut disc “Free Yourself,” which was certified platinum. Several tours, performances, and television guest appearances later, Fantasia released her second disc in 2006 and on the heels of that release, scored the role of Celie in the Broadway musical “The Color Purple” based on the Pulitzer Prize-winning 1982 novel of the same name by Alice Walker. The Great White Way rookie was scheduled for a six-month engagement that was extended thanks to a huge box-office response to her casting. However, the “AI” alum started missing performances that caused the show’s producers to refund tens of thousands of dollars. But Fantasia is back. And she’s answering questions about her Broadway burnout and talking about the new “The Color Purple” tour, which stops off in LA this Wednesday, February 10 at the Pantages Theater (in Hollywood) until Feb 28. “The Color Purple” was Fantasia’s very first Broadway show. Period. She’d never seen one and was suddenly cast in one. She told EUR’s Lee Bailey that she had no warning on how tough Broadway really is. Fantasia recalled that her first five months on the show seemed to go quite smoothly, but it was month 6 – her original gig end – that she began to wear down and found herself exhausted by the traumatic story of her character’s life coupled with ordeals in her own. So Fantasia left the show to get her life together, but came back because she felt she owed it to people who came to the show and missed her, but there was another reason for her sabbatical from the production. No one, including Fantasia herself, knew that at the end of her initial stint on ‘The Color Purple,’ she had two tumors on her vocal chords. Upon leaving the production, Fantasia did a performance at Clive Davis’ Grammy party of the song “I’m Here,” a favorite of “The Color Purple” musical. “After that I wanted to go to the doctor,” she said. “I don’t like the doctor. I’m scared of the doctor. So if you hear me say I want to go to the doctor, I don’t feel well. Fantasia and her doctor discovered that she had two tumors, and that the tumors probably played a role in her fatigue doing the show. She, nor her management, really made a statement about her illness, meanwhile, reports were flying that the young star was irresponsible or too immature to handle a Broadway role. Even on her recent appearance on “The Oprah Winfrey Show,” she was asked quite directly about her first departure. Fantasia’s doctor came on the show, too to talk about how she had tumors that could have been cancerous or even taken away her voice. As we stated, Fantasia Barrino is currently reprising the role of Celie in Los Angeles as “The Color Purple” tour is scheduled there from February 10-28. For ticket info, go here. 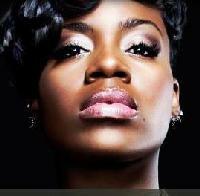 Look for more on Fantasia in Part 2 when she discusses her spoiled brother, her family and her VH1 TV show. How many times will Fantasia keep returning to the Color Purple? i guess she needs to do something to make money because she insists on supporting almost all of her family including her ungrateful brother. She is a good one I would not continue to financially support grown azz adults who are not appreciative at all.